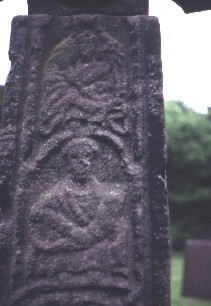 Cross, west face, detail on shaft. This is the west face of the cross. The lower panel, above the interlace, may represent Christ in glory, or it is possibly one of the prophets (Hawkes). The panel at the top of the shaft may represent the Blessed Virgin Mary (Hawkes).